What do you wear to fashion week? We’re in the midst of fashion month right now, and all kinds of advice is floating around the internet. One of my favorites is to wear something that reflects your everyday look but is dialed up a notch or two. I like this outfit I wore to Emily Payne’s show, NYFW – it reflects my personal style. The Venetian glass pendants worn together makes it special and unique. And after attending NYFW, I know how I will turn it up for fashion week events in Vancouver, Canada and San Francisco. Here are 3 new fashion week outfits and some NYFW looks which inspired them. Let’s start with one partially inspired by Liliya. This is what she wore to the Emily Payne NYFW show. It’s always nice to make a reference to a trend which we embrace, and anything shiny is always fun, in my opinion – this time, sophisticated. Did you read the story behind the making of this outfit? Metallic need not be formal, however; it can also add a little zing to a more casual outfit. My first outfit, in fact, includes some zingy metallic booties. 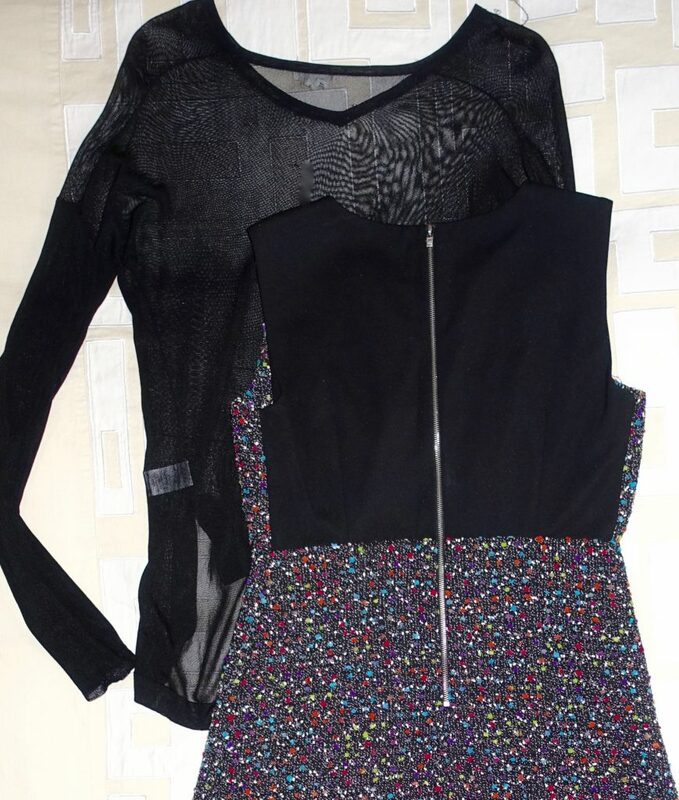 This is what I’ll wear to a San Francisco fashion show this Friday of Emily Payne’s edgy/luxurious collection. I like the pairing of a streetwise denim jacket with a silk A-line skirt. Since the skirt is high-waisted, I’ll wear it with this basic (but ultra soft!) white tee which will be knotted to expose a bit of my mid-section – with the jacket open. I really don’t feel the need to be peacockish – every day. This year at NYFW, casual outfits were just as interesting and lovely as over-the-top looks. Another trend which fits in so well with my personal aesthetic is VELVET! I love anything soft and sensual. Kudos to this woman for finding a way to pull it off with temperatures in the 80s and 90s F (27-37•C) – with adorable matching flats! This is what I’ll wear in Vancouver today (Wednesday). It is considerably cooler here – in the 60s (18-21•C), and so a pair of booties and dress of thicker fabric fits the bill. I’m also adding this lovely vintage necklace featured in an earlier post. I love the look during this transitional time of year of booties with bare legs and a shorter hem. Sassy and fun! If I need an extra layer, this semi-transparent top which I also featured here will look great underneath. Notice how the back of the dress is of a different fabric. I love a variety of textures. For a moment I wondered if I was going a little too dark, but then I recalled some awesome all-black looks headed to the New York shows, including this one by Chiara Ferragni to attend Alexander Wang’s bash. She does that slip dress trend sooo well! For my third look, to be worn Thursday, I decided to wear long boots with another short dress. But I decided I would go for bright colors this time. Why not? After all, I will be seeing Spring 2017 designs, and some color, as you see on this woman during NYFW will definitely put me in the mood. 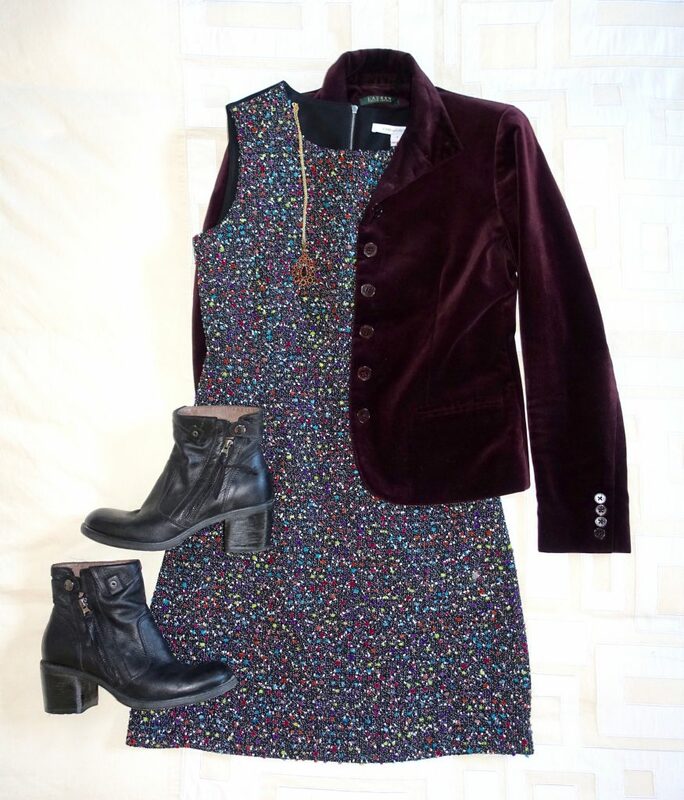 This is Thursday’s outfit – or if I feel like switching out my Wednesday outfit for something different. I learned at New York last week that it makes sense to bring at least a couple of spare outfits in case you get a stain or for some reason you just don’t feel like wearing something you’ve packed. I didn’t try it on with the flashy jewelry – the necklace is of Venetian glass and the earrings and bangle were from the gift shop at the Picasso museum in Barcelona. 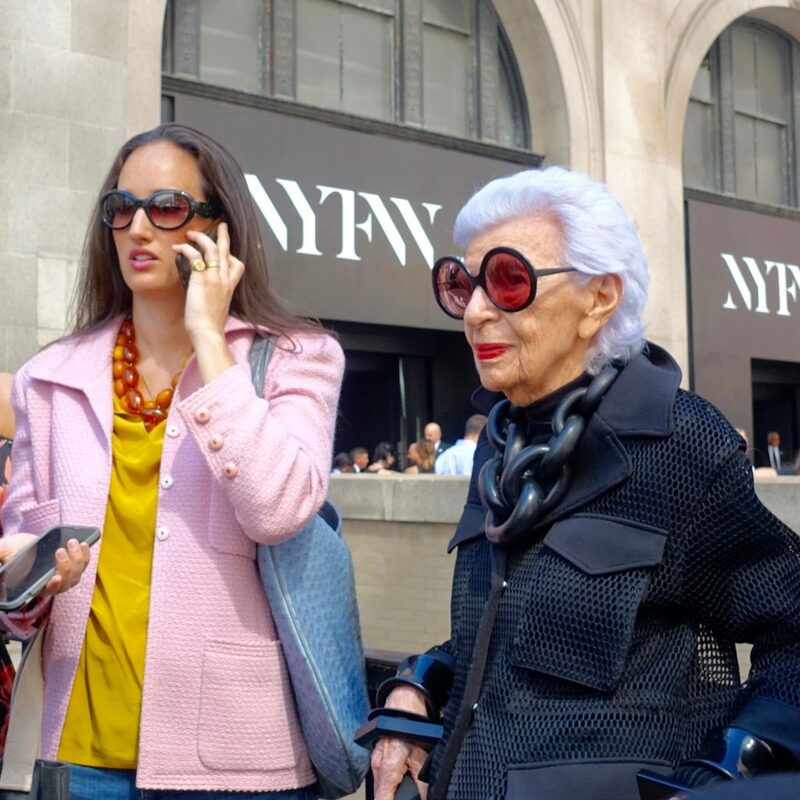 I might as well see if I can go a little Iris Apfel – such an inspiring lady! The joy of dressing for fashion week is that there is so much to choose from – you can wear sneakers or stilettos, dress formally or casually or somewhere in between, go with bright or muted tones. It’s all a matter of personal preference. What are some of your favorite fashion week looks? Totally digging your #SFFW outfit. I will see you there in my polka dots !since I am leading the show’s makeup and nail team. I will be on the comfy but funky side – my SassyT self. Did I tell you how much I love “thestyletti.com”? You look gorgeous in your outfit, Janea! I love the coordinating set and the pendent necklaces you wore layered, so pretty! I also love the inspiration you’ve shared here for what’s inspired you in creating the rest of your Fashion Week looks. I hope you’re having the best day so far and thanks so much for sharing, beauty! Oh wow, there’s so much style inspiration within this post! The burgundy velvet blazer is gorgeous and I completely agree with you, Chiara Ferragni wears any slip dress SO well. That’s a gorgeous shot of her too, so dreamy with the tiara!